KUALA LUMPUR: It may be his last Sukma outing but Sarawak’s best bet for the gold medal in judo Brenton Sim is not piling any pressure on himself to defend the gold he won in Sukma XVI. “I will give my best for Sarawak and hopefully I can perform well again,” said the 20-year-old from Kuching who is now pursuing a martial arts degree in a Taiwan university and continuing his judo training there. Competing against six others in the men’s 81kg and below category the defending champion is wary of the threat posed by the contestants from Johor and Terengganu. “I beat the Johor opponent in the final in 2011 and I am sure he would want to avenge his defeat. It would be a folly to take the Terengganu opponent lightly too,” he said. 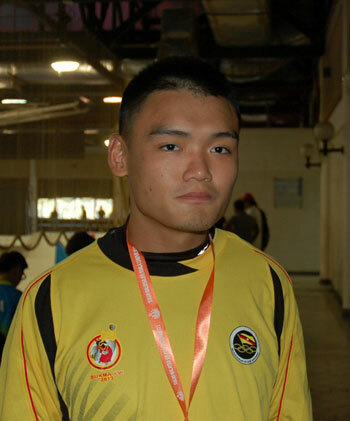 Having won the bronze medal in the same category in Sukma XIV in Melaka three years ago and gold in Sukma XIV in Kuala Lumpur, Sim is gunning for a golden Sukma swansong at Bukit Jalil this year. Meanwhile, in yesterday’s women’s kata competition, Bong Li Qing and Chang Bui Kiun failed to impress the judges missing the bronze medals by eight points when they collected 344 points for their performance while Johor and Terengganu won the bronze medals with 352 and 353 points respectively. Penang took the gold with 365 points and the silver medallists were Selangor who garnered 360 points. Sarawak will be banking on Lai Li Wei, Soh Yew Ing and Van Vacqur Cotter Edward Tambay to win something in today’s bouts. Lai will be competing in the men’s 55kg, Soh in the men’s 60kg while Vacqur will challenge for the medals in the men’s 66kg.